It's Day 3 of My Creative Time April Sneak Peeks, and today Emma and the design team are showcasing TWO new MCT products! Can you guess what they are yet? Well, let's start by looking at the base of my card. It's an A2 size ripe avocado base, layered with patterned paper from the My Mind's Eye Lost & Found Two: Breeze collection. I used this paper for everything on this card! Here's sneak #1! 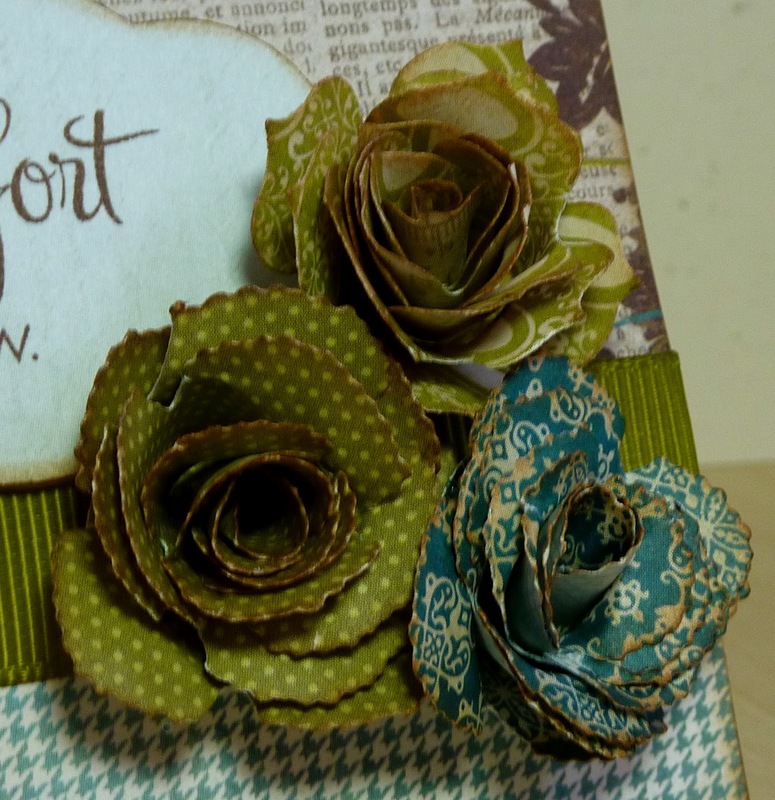 This gorgeous sentiment is from the new My Creative Time Floral Sentiments stamp set. 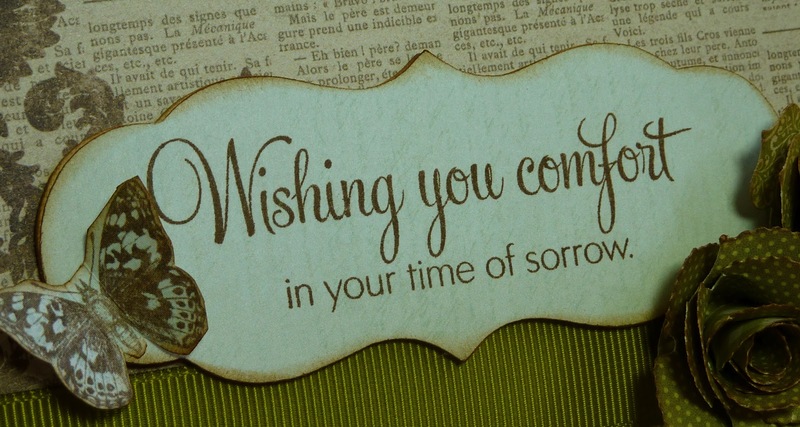 I love the classy font, and this particular sentiment is just beautiful for a sympathy card. The frame that I stamped it on was made with the Cricut Art Philosophy cartridge, cut at 1 1/2". It's mounted on the coordinating chipboard that comes with Art Philosophy. I cut the little butterfly from one of the patterned paper sheets from Breeze. Now, onto sneak 2! Emma has created some rolled flower dies! Aren't they gorgeous? And they are so easy to whip up using your Cuttlebug or other type of machine. Notice that there are two different styles. Love them! With all of our Sneak Peek weeks, Emma likes to do some FUN giveaways! For a chance to win, just leave comments on Emma and the rest of the design team's blogs! You do NOT have to comment on every blog, BUT, if you do, you will have more chances to win! For MORE chances, you can spread the word to the world about this release on Facebook and to whatever other connections you may have! Let us know on the My Creative Time Facebook page that you did so, or you can just tag Emma in your post! Emma will randomly pick and announce all winners on Thursday, April 19th, during the Stamp Release Blog Hop, happening at 12:01 PST in her video! Good luck! Log onto your Facebook now, and let's start spreading the word! And be sure to stop by My Creative Time to see more great projects showcasing these two new stamp sets by Emma and the rest of the design team! Katie, beautifully done, elegant and tasteful. Such a pretty card with fabulous flowers. What a gorgeous card!!! Those flowers are amazing!!! Thanks for sharing another awesome creations!! Very pretty!! Love that you used patterned paper for the flowers! I am officially in love with these flower dies!!! Beautiful card, beautiful sentiment! Wow I love the paper you picked for the flower and the elegant look of the sentiment. Beautiful job well done TFS AJ! Katie i absolutely love your card you did a wonderful job on it!!! Thanks for inspiring me to make a set of these. Great job and so elegant too! 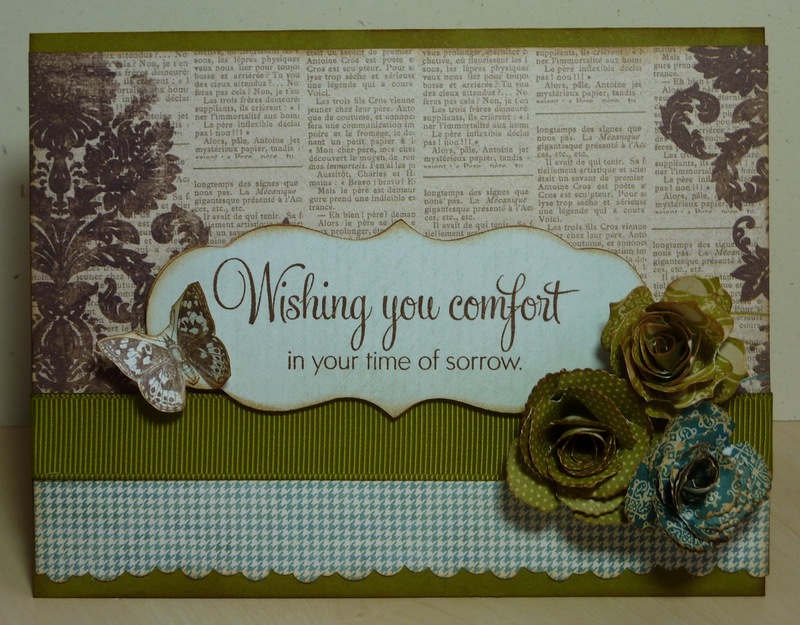 Sympathy cards are very difficult to make. Yours is beautiful and will be very appreciated by whomever receives it. Beautiful card!!! OMG...love your flowers and the card design is lovely!!! Nice touch with the butterfly! Thanks for all the great sneak peeks this week...they've been fab!!! Wow, great card! Love the layout of it and of course the flowers. Thanks for sharing. Katie ~ OMG! First this card would totally comfort someone! The colors are AMAZING together and blend PERFECTLY! The background paper, the shape for the sentiment and your flowers just work so elegantly together! AWESOME job! very nice and elegant sympathy card. Love the flowers. What a gorgeous card. Love the patterned paper flowers. Oh Katie, this is gorge! Love the palette and the mixture of papers! I could have used these MCR products to make sympathy cards if I had had them, since I've needed several lately.TFS. Lovely card--I like the papers you used for the flowers. very elegant, love the background and the flowers are lovely!!! Elegant card, love the colors. TFS. This is a fabulous card! Beautiful! I really love the flower dies. Think I may have to look into getting those. So very pretty!! Love the papers you used. Love the colors and your background paper. Beautiful card, thanks for sharing. Beautiful card! I love your paper choices. This looks like another winning release! I can't wait for tomorrow. What a beautiful card. The flowers really pop and add so much elegance. Thanks. Wow, Katie, this is just stunning!!! Absolutely Beautiful!!! this is beautiful!! love it a lot! Beautiful work. I love the vintage look. You have a wonderful eye for color, the paper and the ribbon match perfectly! The flowers are beautiful, and the sentiment is lovely. Beautiful, your colors and flowers are gorgeous! I love your card! Its georgous. This is such a wonderful release! I love the papers you chose for your card...they look perfect for this. Cute butterfly too. Beautiful card. Love the stamp and the flowers. Very elegant card Katie. The color scheme is fabulous! TFS yet another fantastic project. Beautiful. Just love the roses.